They are expected to push for some promotions. 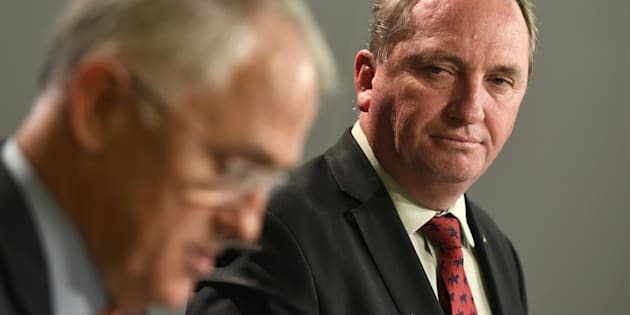 Australia's Deputy Prime Minister Barnaby Joyce (R) looks at Prime Minister Malcolm Turnbull (L) addressing a press conference in after Turnbull rejected calls for him to resign after the disastrous 2016 election. National MPs are heading to Canberra ahead of a party room meeting on Monday to lay down their plans for the coalition agreement with the Liberal Party, following the government's tight election win. The rural-based National party retained all their lower house seats and picked up an additional seat in Victoria -- a victory enabling them to push for an extra ministerial position despite a swing against the government across the country. The Coalition now has 76 seats in the lower house following victories in the seats of Flynn and Capricornia, meaning the government will likely not have to rely on cross-bench support in the lower house. There are reports the Nationals are pushing for a greater say in the Communications portfolio, as well as Small Business or a return to the traditional Nats portfolio of Trade. There is also speculation Indigenous Affairs Minister Nigel Scullion will be removed from cabinet to make room for more ambitious colleagues. If Scullion, who is the Nationals leader in the Senate, goes, there is speculation NSW Senator Fiona Nash will replace him. Earlier in the week Nationals leader Barnaby Joyce told media he wanted the Coalition agreement between the Nationals and the Liberals kept secret, prompting demands from Labor for it to be made public. Liberal Party senator Scott Ryan on Tuesday dismissed the call. The ABC reports the Coalition will struggle to win more than 77 seats in the lower house, with Labor gaining in the count for the seat of Hindmarsh in Adelaide. The ALP has claimed victory in the Perth seat of Cowan, where counter-terrorism expert Anne Aly beat three-term Liberal MP Luke Simpkins. Meanwhile the Prime Minister is expected to face the Liberal party room next Monday, the first such meeting since the election.